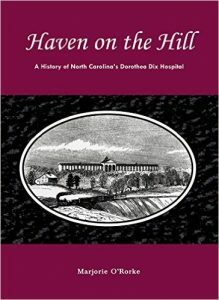 Dorothea Dix Hospital was once home for 2,700 patients diagnosed with mental illness. In 1974, there were 282 buildings on 2,300 acres in downtown Raleigh. 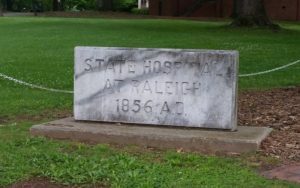 Parts of the original property have been sold or leased to N.C. State University and the City of Raleigh. Today, the remaining 308 acres and office buildings at Dorothea Dix have become home to a new vision for the State of North Carolina and the City of Raleigh. As Marjorie O’Rorke, a Springmoor resident says, “With all of the new condos and housing options being built downtown there is an important need for the city to have a place to exercise, learn and play.” What began as a volunteer position at Dix for this young nurse turned into a 40-year volunteer adventure. She and her husband came to North Carolina when he enrolled in law school at Duke. With a graduate degree in nursing from Yale, she continued her nursing career as a Duke surgical supervisor. Living in Raleigh, it was important to her to also find a volunteer activity to keep her busy. While she was volunteering at Dix, the Director asked if she would be interested in developing a picture project of Dorothea Dix. Much had been written about the 1848 establishment of the property, the legislature’s continuing role, the nursing school, the 1926 fire and the patient care through 1970. She was given the task to document the years from 1970 to 2008. With an undergraduate degree in history and her nursing background, this project was a wonderful combination of her skills. Little did she know that it would take 20 years and many fundraising appeals to finish the project. Never did she think that she was going to write a book. Finishing the project during the recession proved to be an uphill battle for publishing her work. 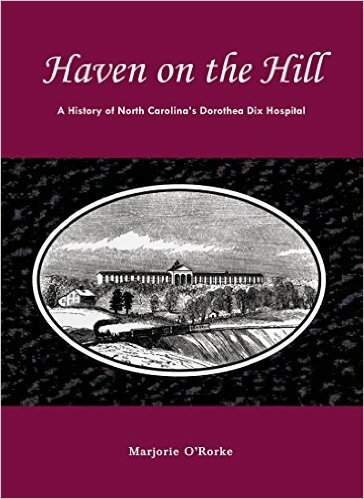 With the help of the N.C. Department of Cultural Resources and the Office of Archives and History, Haven on the Hill, was finally put into print. Her research was all written in longhand. As she said, “I never took typing in high school,” she said, “Oh, this project would have been much easier” if she had! Today, as she continues to help, she pulls out her iPad to correspond with the volunteer committees she is still involved with in the future of this exciting project. The Dix Park Conservancy volunteers have traveled to New York, St. Louis and other cities to look at parks and conservation projects. In 2003, the state began construction of a new mental health hospital in Butner. 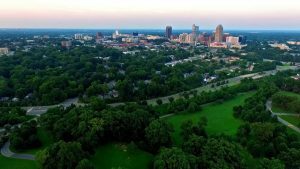 The State of North Carolina and the City of Raleigh have come to an agreement on the sale of the property and Marge’s volunteer role continues with the Dix Park Conservancy. 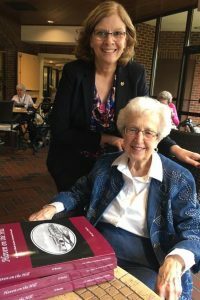 She has served on the Dix Park board with other interested citizens and as a consultant for the legacy committee to promote, preserve and educate the history of the hospital. She is an advocate for Mental Health Services. With the help of a younger volunteer, she has made a power point presentation that she uses when she speaks to groups. Mayor Nancy McFarlane visits with Marge O’Rorke at Springmoor. Her vision for Dix Hill is to have a museum to educate the visitors and preserve the history of the institution. The families of the patients, she says, “play an important roll in keeping the history alive.” She would like to see recreation, restaurants and a “place to play” along with the museum. She cares deeply about the staff that worked at the hospital. They will always be an inspiration to her. 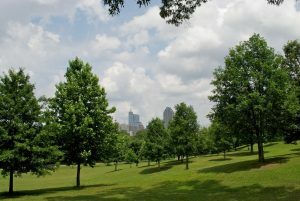 The Dix Park Conservancy and The City of Raleigh say “just about anything is possible” with this beautify piece of property. Asked if she’s working on another book, she laughed and replied, “No, that was enough.” She is working on her own family history in a Springmoor class with Dr. Jim Clark. An English Professor Emeritus from N.C. State University’s School of English, he is a popular lecturer for those residents interested in his Life Writing Workshop. 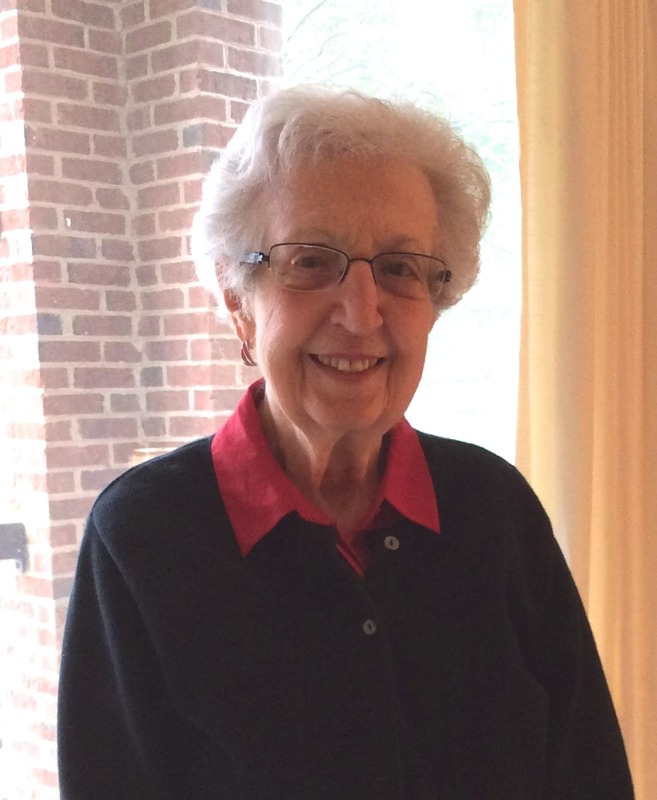 She also attends the Osher Lifelong Learning Institute at N.C. State and enjoys every class she has taken. In the next few months, The Resident Life Committee will feature a speaker from the City of Raleigh to update us on the progress and the visions for the future park. The architectural firm will soon be hired and an executive committee for fundraising has been put in place. The advocate behind the scenes, from Springmoor, will always be Marge. She too, is as dedicated to the past and future of this beautiful property as the notable reformer and advocate Dorothea Dix was in 1848.